Renault. Live your BIG LIFE thanks to MKR! Renault is a brand that stands for passion, tenacity and creativity. We are proud to support the teams of MKR who are putting it all on the line to live their BIG LIFE and follow their passion for cooking. 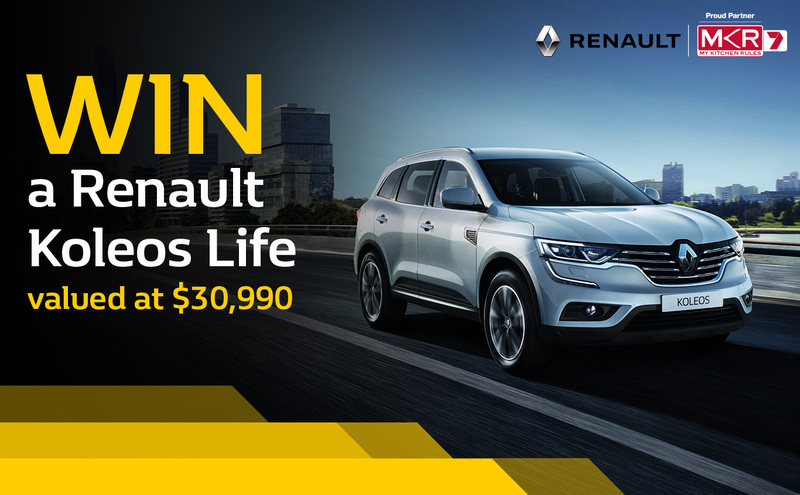 Live your BIG LIFE by entering the competition below to win a Renault Koleos Life valued at $30,990! 2.1 Subject to clause 2.2, entry is open to all residents of Australia, who are aged 18 years of age or older, where the Channel Seven (and affiliates) signal is received. 2.2 Employees and their immediate families of the Seven Network (Operations) Limited, Renault Australia, Ansible Pty Ltd and their associated agencies and companies are not eligible to enter. 3.1 The Competition commences on Sunday 10 February 2019 at 09:00 AEDT and concludes on Sunday 5 May 2019 at 23:59 AEST (“the Competition Period”). 3.2 In order to enter, viewers must watch My Kitchen Rules on the Seven Network and affiliates, when a Competition segment will be aired inviting viewers to enter. b) enter online at mkr.7plus.com.au/win and complete the entry form with their full name, contact phone number, postcode and email address. 3.4 Entrants are limited to one (1) SMS entry per mobile phone number per day and one (1) Online entry per email address, for the entire competition period. 3.5 Entries must be received by Sunday 5 May 2019 at 23:59 AEST. The time of entry will in each case be the time the SMS message or Online entry is received by Ansible Pty Ltd SMS database and Seven online database. 3.6 Each SMS entry must be charged to a mobile account and SMS entries via the internet, computer generation or “scripting” are invalid and will not be accepted. 3.7 Any online entries determined to be “scripting”, in the absolute discretion of the Promoter, will be deemed invalid and not accepted. Those deemed to be scripters will be blocked and their entries null and void for the full duration of the competition. 3.8 SMS entrants will receive a reply message to their entry. 3.9 Each SMS entry will be charged at premium rate, namely $0.55 (including GST), which covers the entry and the reply message. Any cost associated with accessing the online entry website is the entrant’s responsibility and is dependent on the internet service provider used. Tot al maximum prize pool value for the prize is up to $30,990.00.Prize value is correct as at the date of printing. The Promoter accepts no responsibility for change in prize value between now and the ultimate date on which the prize is taken. a) The winner will be required to provide their details to Renault Australia within eight (8) weeks of being contacted by the Promoter. b) Receipt of the Major prize package is subject to the winner being able to lawfully take possession of the Prize and comply with all registration and compulsory third-party insurance requirements of the state/territory in the state/territory the major prize winner elects to register the Prize. c) If the winner of the major prize does not have a valid Australian Driver’s Licence, the Prize can be transferred to a nominated family member upon the approval of the Promoter. d) Vehicles depicted in all promotional material relating to the Competition are not necessarily the same colour or specification as the Prize. The colour of the vehicle is at the discretion of Renault Australia, subject to availability. Vehicles depicted in video led promotional material are 2018 plated Koleos Life, wheras the prize is a 2019 plated Koleos Life. Changes which have been made to 2019 plated Koleos Life are the removal of roof rails and the removal of tyre pressure monitor. These changes reflect against 2018 plated Koleos Life. e) The Prize will be delivered to the winner’s closest Renault Dealership or as otherwise reasonably nominated by Renault Australia as soon as is practicably possible however no later than 6 months from the date of the drawing of the Prize. Neither the Promoter nor Renault Australia are liable for any costs associated with the winner travelling to their nearest Renault Dealership to collect the Prize. f) The Prize includes the following: 12 months’ vehicle registration, 12 months compulsory third party insurance, stamp duty, and dealer delivery charges. All other charges including all optional extras and accessories, comprehensive insurance or any other insurance not stated, petrol, personal costs and all other ancillary or related costs not expressly stated do not form part of the Prize and are the sole responsibility of the winner. 4.3 In accepting the prize the winner agrees to participate in and co-operate with all reasonable media editorial requests, including but not limited to, being interviewed and photographed, and the winner grants the Promoter and Sponsor a perpetual and non-exclusive licence to use such footage and photographs in all media worldwide and the winner will not be entitled to any fee for such use. 4.4 The winner agrees they will not sell or otherwise provide their story and/or photographs to any media or other organisation. 4.5 It is a condition of accepting the prize that the winner must comply with all the conditions of use of the prize and the Sponsor’s requirements. 4.6 In the event that an element of the prize outlined in the above is cancelled or postponed for any reason, the Promoter reserves the right to substitute with a similar product of equal or greater value, subject to state regulations. 4.7 The prize is not redeemable for cash and are not transferrable or exchangeable, unless stipulated in these terms and conditions. 4.8 Once the prize is accepted, the winner must deal directly with the Sponsor. 4.9 Independent financial advice should be sought as tax implications may arise as a result of accepting the prize. 5.1 There will be one (1) winner drawn from the national pool of SMS and Online entrants. Each entrant who has entered the Competition in accordance with these terms and conditions during the Competition Period using a mobile phone with a reply path and whose SMS message has passed through the telecommunications carriers network to Ansible Pty Ltd database or entered Online with all the required details by Sunday 5 May 2019 at 23:59 AEST (“Qualifying Entrant”) will be entered into the draw. Entries that do not comply with any of the terms and conditions may be deemed invalid. The draw will take place at Ansible Pty Ltd, Level 1, 16 Anster Street, Adelaide, South Australia 5000 on Tuesday 7 May 2019 at 10:00 AEST. 5.2 The winner will be notified by a phone call from the Promoter on the day of the draw, and a letter advising the winner of their prize will also be express posted. The winner’s entry details will be published in the Public Notes section of The Australian newspaper on Monday 13 May 2019. 5.4 The Promoter may in its absolute discretion deem entries invalid subsequently to a winner being notified or a winner’s name being announced if it is discovered that the winner did not enter the Competition in accordance with these terms and conditions. In these circumstances, an additional draw will be conducted. 5.5 It is a condition of accepting the prize that the winner may be required to sign a legal release in a form determined by the Promoter in its absolute discretion. 5.6 Subject to state government legislation, the winner must accept their prize by 11:00 AEST on Wednesday 7 August 2019. In the event of an unclaimed prize, an unclaimed prize draw will take place at Ansible Pty Ltd, Level 1, 16 Anster Street, Adelaide, South Australia 5000 on Wednesday 7 August 2019 at 12:00 AEST and the winner will be notified by mail and their details published in the Public Notes section of The Australian newspaper on Monday 12 August 2019 if required. 6.1 In the case of the intervention of any outside act, agent or event which prevents or significantly hinders the Promoter’s ability to proceed with the Competition on the dates and in the manner described in these terms and conditions, including but not limited to vandalism, power failures, tempests, natural disasters, acts of God, civil unrest, strike, war, act of terrorism, the Promoter may in its absolute discretion cancel the Competition and recommence it from the start on the same conditions, subject to state government legislation. 6.2 Seven Network (Operations) Limited, Ansible Pty Ltd, Renault Australia and their associated agencies and companies will take no responsibility for prizes damaged or lost in transit, or late, lost or misdirected mail. f) arising from or related to any problem or technical malfunction of any telephone network or lines or mobile communications network related to or resulting from participation in this promotion. 6.4 Seven Network (Operations) Limited and its associated agencies and companies assumes no responsibility for any error, omission, interruption, deletion, defect, delay in operation or transmission, communications line failure, theft or destruction or unauthorized access to, or alteration of entries, and reserves the right to take any action that may be available, subject to state government legislation. 6.5 If for any reason the Competition is not capable of running as planned, due to causes including but not limited to tampering, unauthorized intervention, fraud, technical failures or any other causes beyond the control of the Promoter which corrupt or affect the administration security, fairness, integrity or proper conduct of the Competition, the Promoter reserves the right in its sole discretion to disqualify any individual who tampers with the entry process, take any action that may be available, and to cancel, terminate, modify or suspend the Competition, subject to state government legislation. 6.6 By entering the competition, and by collecting a prize, the winner acknowledges and accepts that driving, travel and any other activities comprising the prize, are inherently dangerous and may result in death, injury, incapacity, damage to property or other losses. The Promoter is not responsible for any acts of god, such as adverse weather conditions or industrial action or civil commotion that may occur whilst the winner is travelling. It is the responsibility of the prize-winner to enquire about local issues and conditions at destinations prior to travel. 7.1 The Promoter is the Seven Network (Operations) Limited (ABN 65 052 845 262) of Media City, 8 Central Avenue, Eveleigh NSW 2015. 7.2 The Sponsor is Renault Australia (ABN 11 073 668 596) of Level 4, 10 Nexus Court, Mulgrave VIC 3170. 7.4 ACT permit number: TP 19/02579, NSW permit number: LTPS/19/31348, SA permit number: TP T19/88.